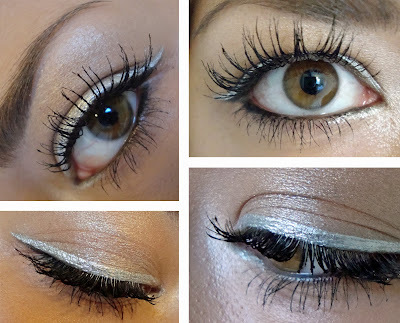 I have been rocking the silver eyeliner today (yes during the day), I think it was the snow that prompted this look! :) I was sent this to review from Barry M and wanted to share my thoughts with you. Firstly, the packaging: Plastic exterior, firm felt tip applicator with screw top lid. The first thing that impressed me was it set after a few seconds & it did not budge even after vigorous rubbing. The formula of this is quite silky, not gloopy like the Gosh metallic liners, it's much easier to work with. It's also pigmented, what you see is what you get! Well done to Barry M! I got a lovely compliment from my husband when he saw my eyes, even my mum complimented me, she wants one too now! TIP: Why not add some reflects glitter from Mac over the top for a flirty more striking night time look this season! This metallic liquid eyeliner is also available in black, blue, green, gold and pink. (I think I also want the black one!) Click HERE to view! FYI: I did not get paid to review this, this is my personal opinion. I love the gold one that I have, its so pigmented! Wud u mind me asking u something? What camera do you use? or is that ur mobile? Happy weekend! thnq in advance, M.
Wow! I never thought I'd be into a metallic eyeliner until now. That looks gorgeous! Loving the eyeliner. What mascara are you using here? could you please do a updated lilash review soon, your eyelashes look amazing! this is so pretty and looks gorgeous on your eyes! This looks beautiful on you! @Divija Reddy its a sony digital camera. Great review. I love the way it makes your eyes look. Flawless! Your eyelashes look SO long against the silver liner. What mascara are you wearing? This is a STUNNING look!!! I want this now! Just amazing. Aw thanks girls :) ur all the best! eyes POP! yes I agree, it would look amazing with some glitter on. What a perfect line, your work and photos are on par with editorial standard. I love your blog! I can't get over how clean and beautiful the line looks! 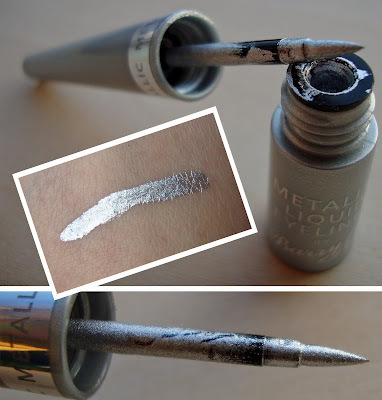 I think you've turned me into a lover of silver liquid liner--at least this one, haha. Great review! ohmygoodness! that looks amazing on you! Love how ur eyebrows look!!!! This looks great, I definatly want to try something like this :) very wintery! I love your eyelashes they look amazing! drinks, food - and dollars off of tabs. They feature almost nightly drink specials and some form of entertainment every night of the week--DJ's, live music, trivia, you name it. quiz according to it. At the end of each round read out the cumulative scores.